The Edge of Joy is a documentary that follows an ensemble cast of Nigerian doctors, midwives and families to the frontlines of maternal care. 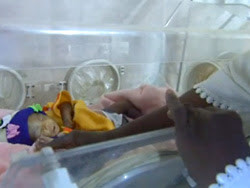 Inside a maternity ward, the film chronicles distressed labors, deaths, and miraculous survival. Outside, lack of blood supply transportation and family planning are examined as causes of the cycle that kills more than 36,000 Nigerian women each year. The central characters in The Edge of Joy are the people deep within the Nigerian culture who know its misconceptions, its limitations, but also its capabilities. Narrated by award winning journalist, Eliza Griswold, and featuring animation by Yoni Goodman, this portrait of pregnancy and childbirth shows the consequences of poor maternal health as it explores the nuances and complexities of bringing emerging health technologies to the developing world. Directed by Dawn Sinclair Shapiro, U.S.A./Nigeria, 2010, 61 mins. Ms. Shapiro is being awarded the 2011 Nafis Sadik Award for Courage for her film by the Rotarian Action Group for Population & Sustainable Development, part of Rotary International. The award will be presented to Ms. Shapiro at Facets immediately prior to this one-night-only screening of the film. A discussion wiith Ms. Shapiro and reception will immediately follow the screening.